Hundreds of women from all over Palestine met in Khan al-Ahmar, on Wednesday, March 6. 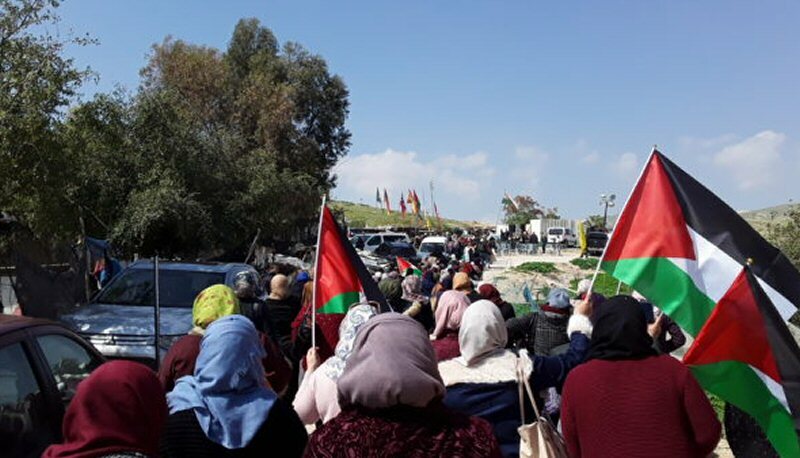 The meeting was a response to a call for solidarity made by the General Union of Palestinian women and the residents of Khan al-Ahmar, as the village is facing renewed threats of demolition. Women met to begin a new wave of resistance in the village after a year of resisting evictions and demolitions. With the upcoming Israeli election, the extreme right in Israel are once again calling for the destruction of Khan al-Ahmar. Politicians are using cleansing and land theft in an attempt to gain votes from segments of Israeli society. This event, held on the Wednesday before International Women’s Day, is especially significant as it marks the first time for several months that a large group have been able to access Khan al-Ahmar. In January, Israeli occupation forces denied PA officials access to the village. This act of defiance by hundreds of Palestinian women will hopefully be the first of many actions to defend Khan al-Ahmar, in the coming weeks.